Most Americans express confidence that private space companies will make meaningful contributions in developing safe and reliable spacecraft or conducting research to expand knowledge of space, according to a recent Pew Research Center survey. 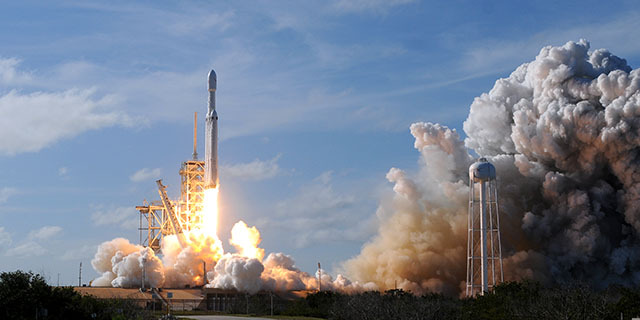 Private companies such as SpaceX, Blue Origin and Virgin Galactic are becoming increasingly important players in space exploration. The National Aeronautics and Space Administration (NASA) has paid private companies $6.8 billion to develop launch systems that might send astronauts into space as early as this year. These companies are also setting their sights on going to the moon or Mars in the future. A large majority of Americans (81%) are confident that private space companies will make a profit from these ventures. 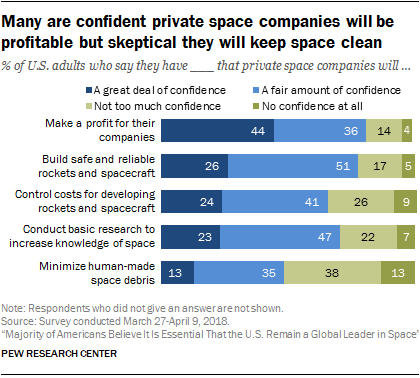 Some 44% of Americans have a great deal of confidence that private space companies will be profitable, and an additional 36% have a fair amount of confidence. But Americans are also cautiously optimistic that private companies will make contributions that benefit U.S. exploration efforts. At least two-thirds of Americans have a great deal or a fair amount of confidence that private space companies will build safe and reliable rockets and spacecraft (77%), conduct basic research to increase knowledge and understanding of space (70%) or control costs for developing rockets and spacecraft (65%). There is more skepticism about whether private companies will minimize human-made space debris. Some 48% have at least a fair amount of confidence that private companies will minimize space debris, while 51% have not too much or no confidence. Space debris increasingly poses a hazard to orbiting satellites and space stations. Earlier this week, President Donald Trump signed a policy directive requiring the federal government to update its practices in mitigating space debris. The small share of the public that is highly attentive to space news – those who say they have heard “a lot” about NASA in the past year and “a lot” about private space companies – is especially likely to express confidence in private space companies. Almost all of those who are most attentive have at least a fair amount of confidence that these companies will build safe and reliable spacecraft (95%) or control costs when developing spacecraft (92%). 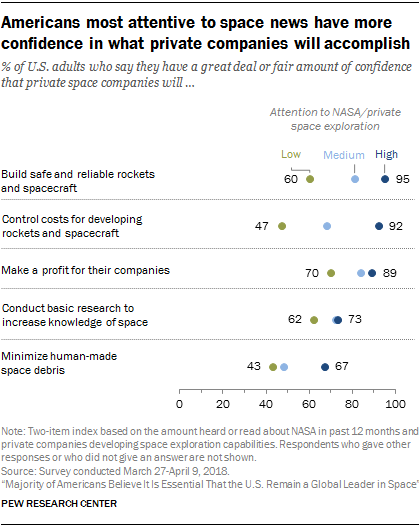 In contrast, those who are least attentive to space news are less likely to have confidence in these private firms. For example, 60% of this group say they have at least a fair amount of confidence that private space companies will build safe and reliable rockets and spacecraft. Men are also more likely than women to express confidence in private space companies’ abilities in these areas. Around three-quarters of men (74%) have at least a fair amount of confidence these companies will control costs for developing spacecraft, compared with 56% of women. And 85% of men say they have at least a fair amount of confidence that private companies will build safe and reliable spacecraft, while 69% of women say this. Even though many Americans express confidence in private companies in these areas, most still see a key role for NASA. About two-thirds say it is essential that NASA continue to be involved in space exploration (65%), while one-third believe private companies will ensure enough progress is made in space exploration even without NASA’s involvement (33%).